← August 2011 Mind the hot embers! SS4329 : Wreck on Westward Ho! beach, near to Westward Ho!, Devon, Great Britain. The Geograph Britain and Ireland project aims to collect geographically representative photographs and information for every square kilometre of Great Britain and Ireland. Wreck on Westward Ho! beach. Very little is known about the wreck. The size and shape of the wreck has intrigued experts, and its periodic appearances have been commented on in books and local newspapers since the 1850’s, when it was described as a ‘very old wreck’. In the 1940’s and 50’s it was described as a ‘Viking ship’ and a ‘Spanish Galleon’. During the summer of 1973 it was photographed and noted by A.X.E. (Army Experimental Establishment) based at Instow, who were doing beach trials at Westward Ho!, but no clear indications of its origins could be found from the remains then exposed. It became clearly visible again in 1997. The exposed structure which was then 82ft(25m)long and 23ft and (7m) at its widest part. The present wreck (measured in Feb.2005) is only 77ft(23.5m) long, as the stern post has fallen forwards and sideways. 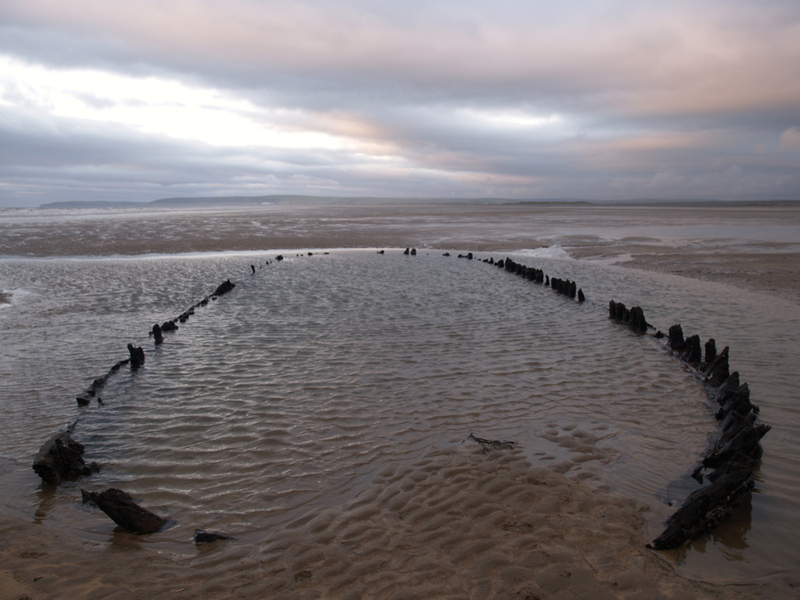 Candidates for the wreck are the ‘Salisbury’ of London, lost on the night of 2-3 March 1759 on Northam Burrows and the ‘Sally’ of Bristol, wrecked on Northam Sands on 17 September 1769. No other wrecks of sufficient size are recorded until mid 19th century, and that one, the ‘Pace‘ wrecked 28 Dec 1868 was later salvaged. The remains could be the ‘Sally’, but until further research is undertaken it still remains a mystery. This entry was posted in History, Shipping and tagged bideford, bideford buzz, Northam burrows, Sally, Westward Ho!. Bookmark the permalink. 3 Responses to Wreck at Westward Ho! Contact me via ‘editor’ for publication permission – I also have other photos taken at the same time.